Over the weekend, Nebraska hosted its first junior day under new head coach Scott Frost. The event was an overall success and not just because Tom Osborne was photographed in that sweet throwback jacket that one recruit told me he wishes he had asked him for. Nebraska had well over 30 prospects on campus with a mix of players that hold offers and some that are close to offers. >>One emerging prospect that made it to campus for Junior Day was 3-star (HV Rating: 89) defensive end Etinosa Reuben‍. The Park Hill South (Kansas City, Missouri) defender doesn’t yet have an offer from Nebraska but does have a dozen offers including Notre Dame, Minnesota and Missouri. He was definitely given something to think about after seeing the Frost-led Huskers. “I had a great experience," he said. "I learned a lot about the team and what they’re trying to do. I’ve been talking to Coach [Ryan] Held for maybe like a month or a month in a half. I got to talk to coach a little bit. It was good. It went well." Rueben says that being able to check out a practice was cool and it was really fast-paced. Right now, he has a visit planned to Iowa on the April 20 and possibly Oklahoma State on the April 28. He’s looking for team culture and academics the most in his future college. >>Perhaps the best running back in the state of Nebraska this year once again resides at Omaha North. 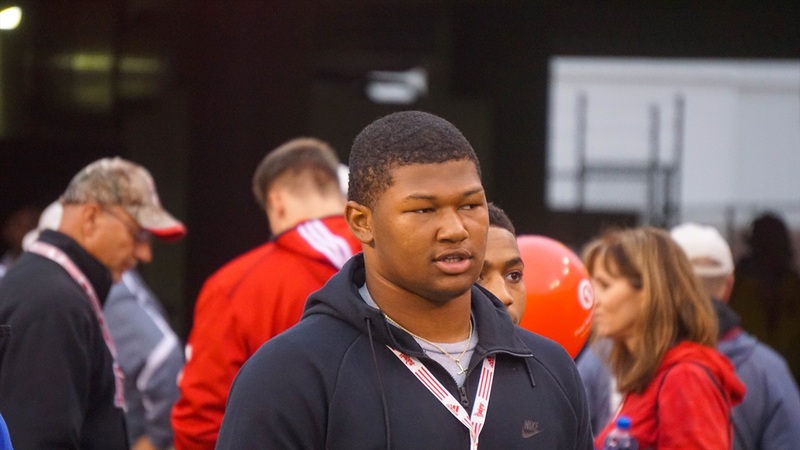 2019 running back Zander Gray‍ made his way to Lincoln for junior day. He told me that the trip was nice and, while he didn’t get to speak with Held, he seems like a nice, chill, laid back guy. I have been told that this staff views Gray purely as a running back while the previous staff toyed with the idea of defense for him. >>No commitments came from the day which is not a surprise but the Huskers improved their standing with several top targets. In particular 4-star DE/OLB Marcus Hicks‍, 3-star LB Luke Fulton‍, 4-star OL EJ Ndoma-Ogar‍ and 3-star RB Rahmir Johnson‍ all came away impressed. I spoke with Johnson and he is certainly feeling the love from the Nebraska staff. I wouldn’t be surprised if all four of these players made it back for officials in the fall. >>The local talent at the event was strong as well. Two of the three current 2019 commits, ATH Garrett Snodgrass‍ and DL Ethan Piper‍ were both on hand to spend some quality time with the new staff. Even though it was “junior day” the 2020 group of in-state players really stands out. WR Zavier Betts‍, RB Miko Maessner‍, WR Xavier Watts and RB Jay Ducker were all in attendance. Right now, only Betts has an offer from Nebraska but keep an eye out for every one of those prospects to get offers at some point. >>Finally, a couple of notes from spending most of Sunday talking to recruits both in and out of the state. Regional recruiting is already helping the Nebraska staff make connections with prospects. Each player I talked to, knew multiple coaches on staff and I think that helps them feel more comfortable with Nebraska. Also, there was a lot of talk about how up-tempo and fun practice was. Not only did that give the visitors a glimpse into what it takes to play college ball, the Huskers are creating a destination event with their fun practices.